Oh Necco Sweethearts, February just isn't the same without you! 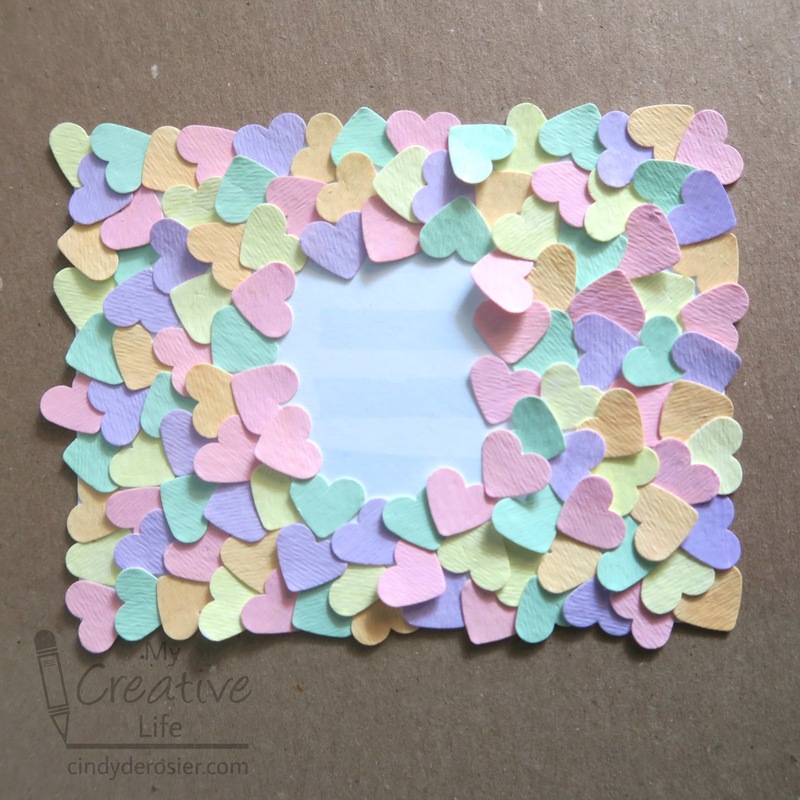 I'm dulling my pain with Brach's Conversation Hearts, which inspired this project. There are affiliate links throughout this post. Pour a large handful of conversation hearts into a dish. 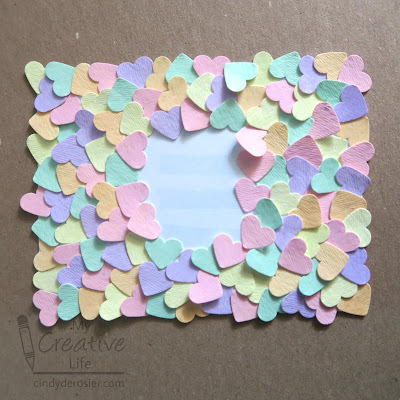 Remove one of each of the colors and set them aside, then eat the rest while you make this craft. 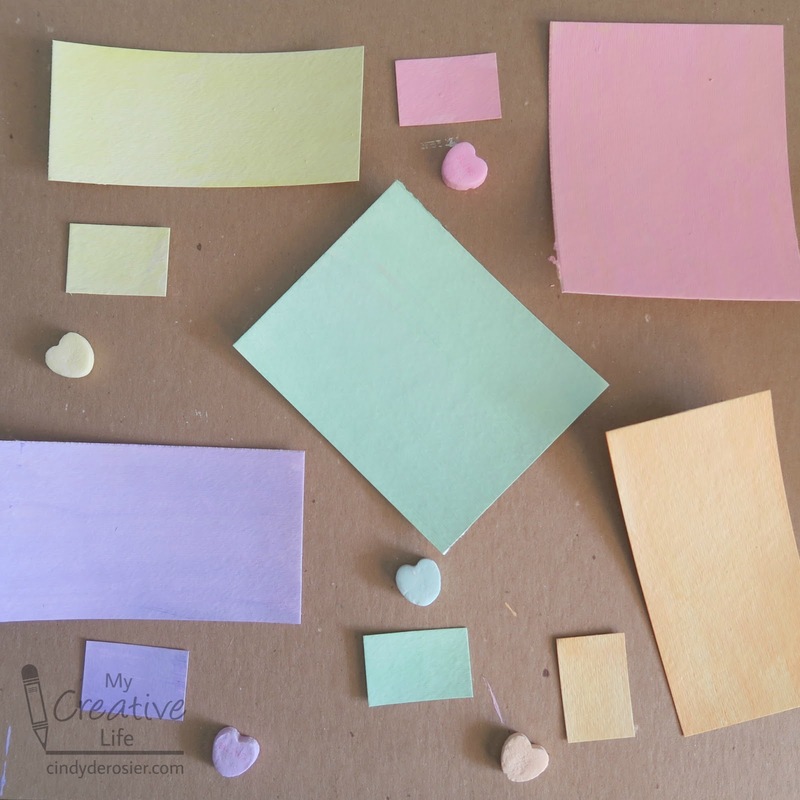 Cut a piece of watercolor paper into five chunks that are each approximately the size of an index card. Trim the scraps so that you have five smaller rectangles. 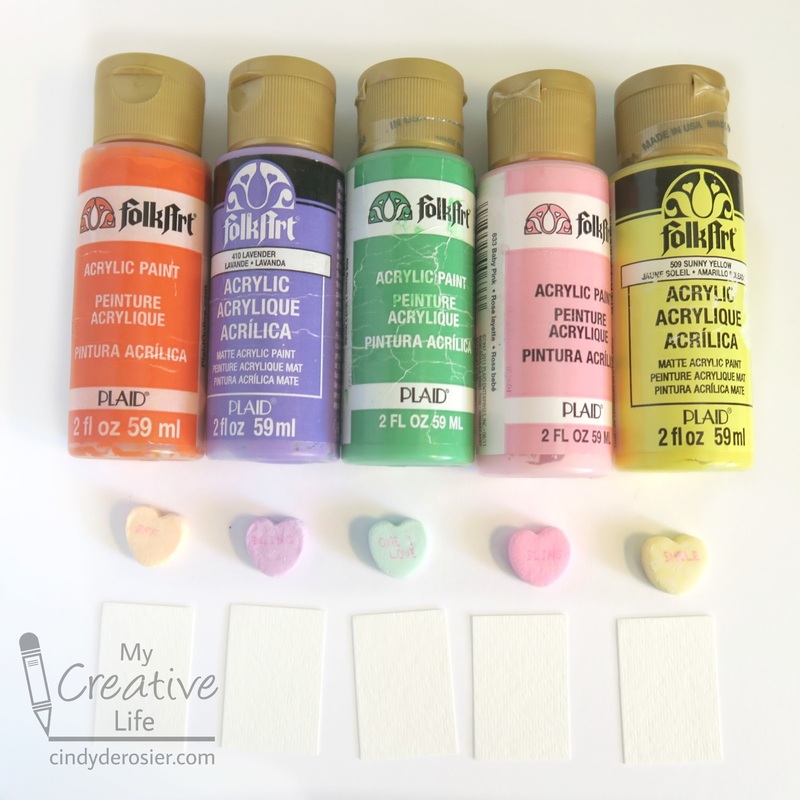 You'll be using these to try to match the colors of each of the conversation hearts before painting the larger pieces of watercolor paper. Working with one color at a time, mix a small amount of paint into a slightly larger amount of white. Adjust until the color looks like a match. Paint it on the sample piece. If it's a match, paint the larger piece of watercolor paper. Repeat this process for each of the colors, except Baby Pink. It is a perfect match straight out of the bottle. Let the paint dry completely. When the paint is dry, punch out as many hearts as you can from the papers. Cut the white cardstock to make a card base (mine is 4" x 5 1/4"). Glue the hearts haphazardly to the cardstock, working from the outside in on all sides. The center area does not need to be covered. Let the glue dry, then give the card a vigorous shake. If any hearts come off, add glue. When the glue is dry and all the hearts are very secure, continue. 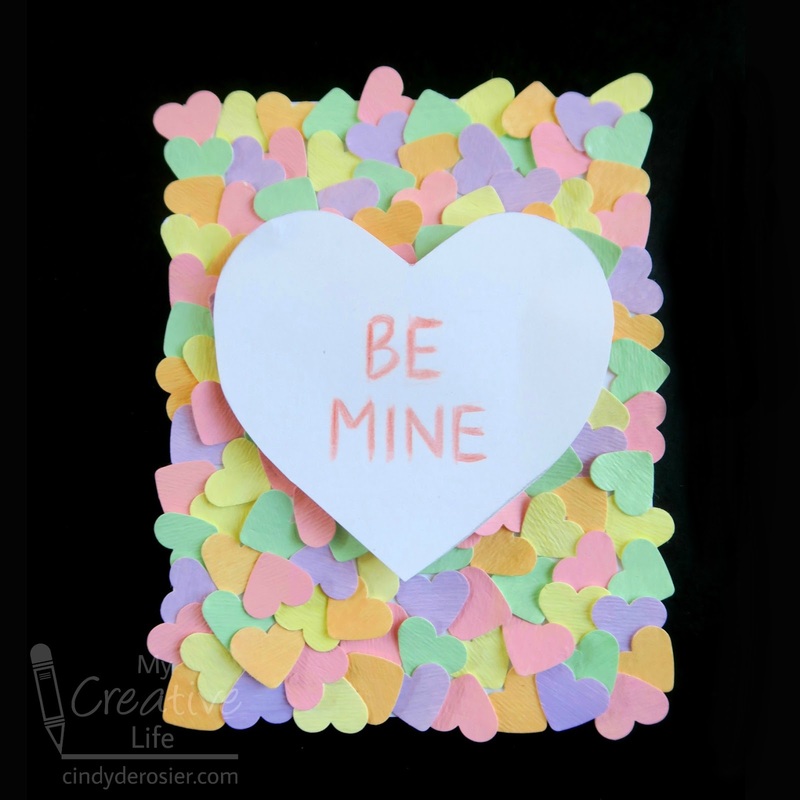 Cut a white cardstock heart that covers the empty spot on the card. Use a red colored pencil to write your message in capital letters. 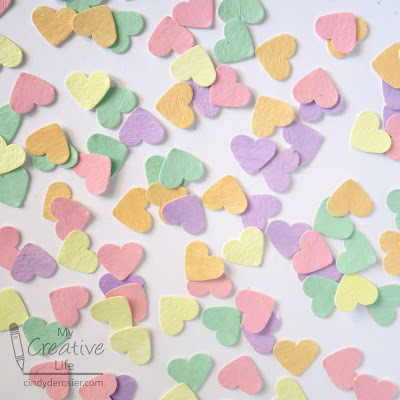 Use foam dots to adhere the heart. My card fits nicely into an envelope. You can make yours larger if you'll be hanging it on the wall, or smaller to use it as a gift tag. 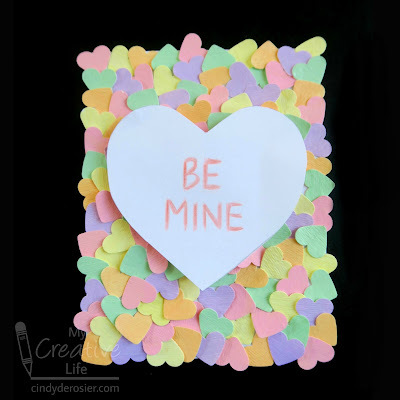 For a more durable piece of artwork, try using Mod Podge to add your faux conversation hearts to a canvas or a frame. So many possibilities! I loveeeeeeeee this! Pure GENIUS!!!!!! This turned out so pretty, love it!